Eric Fischer has let loose with the historo-scanner once again. 1970: A line to see the brand new shiny 24th St BART station (looking south at the SW escalator — the side towards Valencia and 25th). Kidding. Actually a shoe store. Note the miniature trees up on Bernal alongside the AT&T microwave antenna. 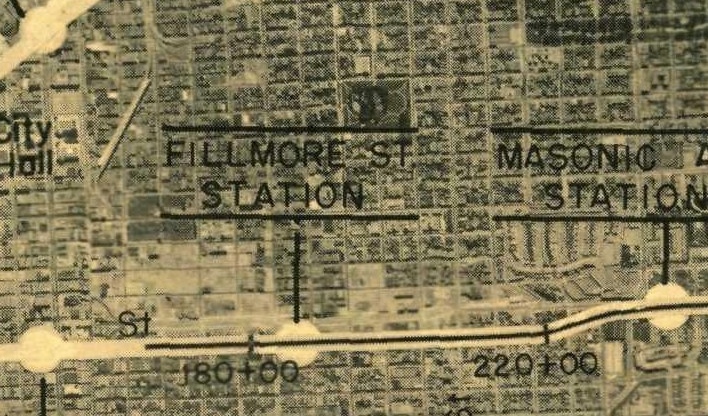 Eric notes that the Marin line that would have come in over the Golden Gate Bridge didn’t actually connect into the rest of the system — you would have had to transfer at Kearny St Station, next to Montgomery. As Eric notes, in the 1961 aerial shots you can see where they were literally destroying the Western Addition. 1978, NE corner plaza. 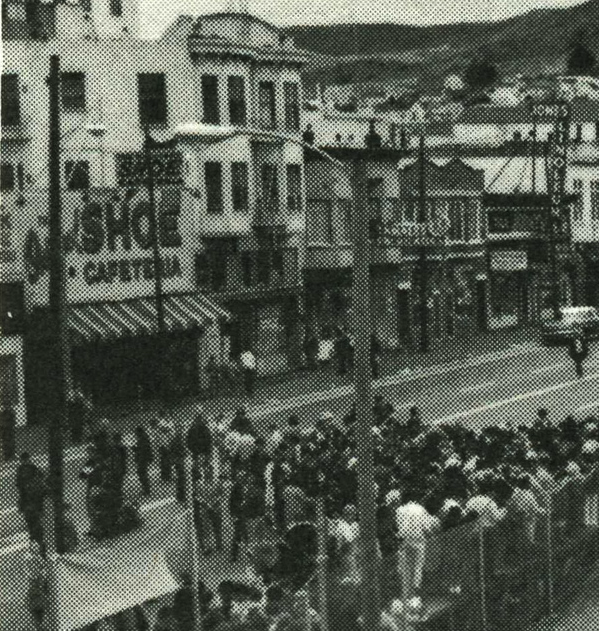 Note the mural (anyone know where that 1970s essay predicting the gentrification of the Mission is?) Also, you can see the very edge of the Smile Awhile sign. 1978: bikes on BART. Eric notes that bikes were only allowed on the last car then. 2. Dude in the bottom picture just wandered in from the shoot for Sabotage? I like that it’s the ORIGINAL Shoe Cafeteria. Not to be confused with all the imitators. As alluded to in the caption under the first photo, I am so glad BART followed through with the “handsome landscaping” at the 24th Street station. Great post as always…. HDPDV is right: Do not mistake this Shoe Cafeteria for the FAKE ones! I love that they were keeping track of how many folks were checking out the new stations. 11,000 : Largest number ever to attend! And cigarette ads on BART! Oh wait, I think I saw an American Spirits ad the other day. Is that wooden (faux-wooden?) paneling by the doors? Aerial shot of “redevelopment”: very cool. I can’t tell for sure, but it looks like this is before Mission st sidewalks were redone with those deadly, slippery-when-wet tile inlays. Anyone know the “when and why” of those things?